Rat, Wind in the Willows. If, like Ratty, you like messing around in boats, then London’s Thames River cruise on the Lady Margaret, definitely isn’t for you. There’s absolutely no messing about with this boat. It makes a first business-like beeline from Westminster Bridge to Festival Hall where it loads more passengers, then another to St Katherine’s pier at the Tower of London, dropping off visitors to the Tower and picking up people who have already been, before steaming back up-river to the home landing. .I’d resisted the whole river-cruise idea, strongly. I didn’t fancy being crushed among several hundred other tourists in the stuffy centre of row upon row chairs in the bowels of a rumbling launch. But I caved in the face of that old “can’t visit London without a cruise on the Thames!” argument. Oddly enough, after watching other craft ply the tide, day after day, laden to the gunnels with people, I found myself one of only half-a dozen people on the Lady M’s outward journey and only a handful more on her return. This was probably because on that particular Sunday, the rain that had flooded the Midlands swept down and drove most Londoners indoors. 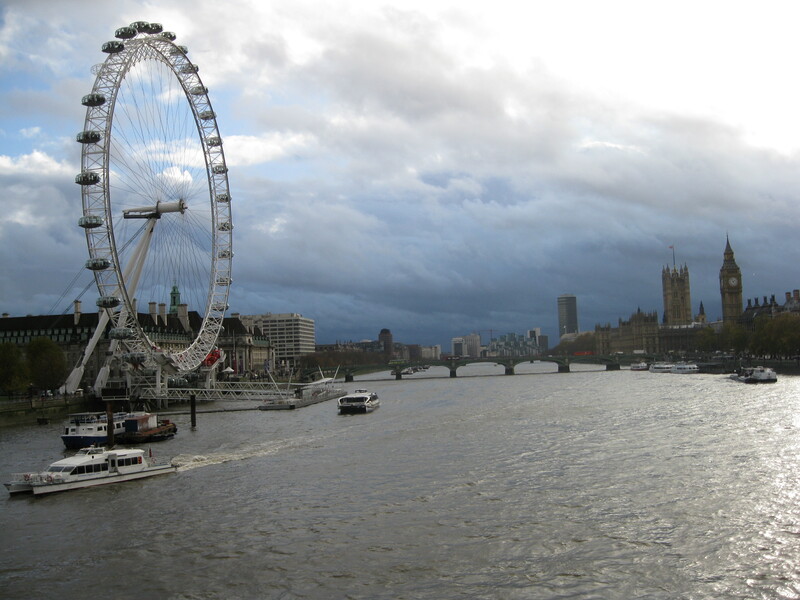 So we sat in the front row seats and looked out over the bow on a spectacular Thames vista, uninterrupted only by rivulets of rain. Somewhere from on high a disembodied David Beckham voice pointed out the landmarks and described them with droll, dry, deadpan British wit as we passed – the London Eye (world’s largest bicycle wheel) The Tate Modern Art Gallery (presently showing a great exhibition of scrunched up newspaper – a must-see for the whole family) the Oxo factory (0s and Xs clock to cheat the advertising ban of the time) the million and one windows of the HSBC building (designed by and headquarters of a pair of Italian window cleaners) Traitor’s gate (where traitors, like Henry VIII’s wives Anne Boleyn and Katherine Howard, entered the Tower from the river to lose their heads) and the bridges – Tower, London, Millenium, Waterloo, Jubilee and finally Westminster. The trip was too much too short and far too expensive. 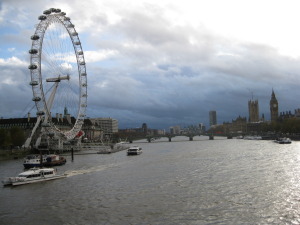 But still, there is something to be said for getting out among the boats and barges on the Thames, even if it was too cold and too wet to brave the top deck and feel the sting of the wind and the spray. London looks different from the Thames.